Make double digit (2-digit) addition and subtraction fun! Great for morning work, math centers, an early finisher activity, or NO PREP for a sub. Students solve equations and then color numbers on the 120 chart a certain color based on their answers to reveal a hidden picture within the chart! There are 30 2-digit addition and subtraction equations per mystery picture. If more than 30 numbers need to be colored to make the picture, there are color codes on the bottom of the equation page listing the rest of the numbers needing to be filled in. 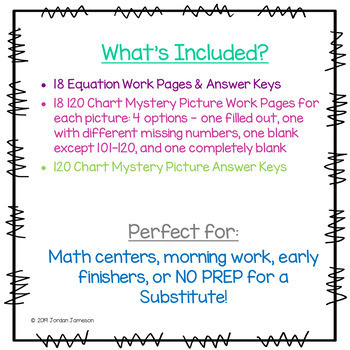 There are 6 different work pages for the 6 different mystery pictures in each of the resources in the bundle, and 4 differentiated 120 charts. One chart is completely filled in, one empty, another empty except 101-120, and the last has missing numbers throughout. 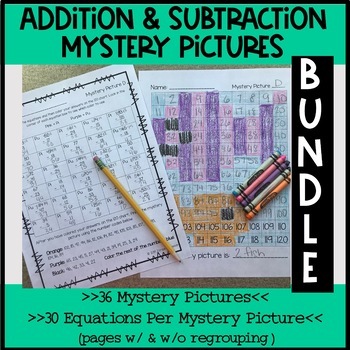 So far this bundle includes 18 addition & subtraction work pages & pictures. See below for more detailed about what is included. Fall and Winter will be added later and the bundle price will increase.